Glaucoma is a progressive optic neuropathy that leads to structural changes in retinal nerve fiber layer (RNFL) and optic nerve head (ONH), as well as characterized changes in the visual field (VF) which may result in irreversible visual impairment and blindness . 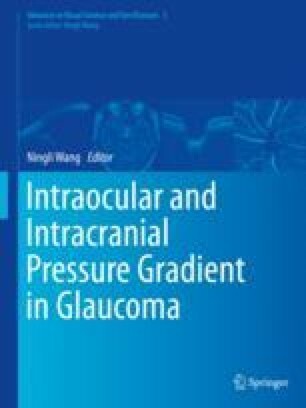 Intraocular pressure (IOP) is always thought to be a major factor in the pathogenesis of glaucoma. Animal model, as a vital method, plays an irreplaceable part in studying the mechanisms of disease progression and developing therapeutic strategies to control the progression of various kinds of diseases including glaucoma. Over the years, high IOP animal models have been established by many researchers, in order to study the etiology, pathogenesis, diagnosis, treatment, and prognosis of glaucoma. Recently, more and more researchers have found that low orbital cerebrospinal fluid pressure (CSFP) may have a role similar to an elevated IOP in the pathogenesis of glaucomatous optic neuropathy [2–5]. The concept of translamina cribrosa pressure difference, which means the difference between IOP and ICP, has recently been accepted. Thus, not only high/low IOP but also high/low CSFP animal models were more frequently studied in recent years.